There are many dogs in rescue centres and animal shelters who are looking for homes. Adopting a rescue dog can give him a new opportunity for a long and happy life as a member of a family. Adopting a dog isn't quite as simple as popping down to the nearest rescue centre and picking out the cutest looking pup though. 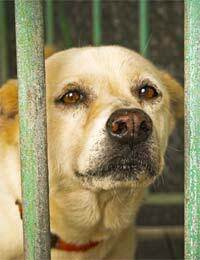 Before adopting a dog it is useful to spend some time visiting animal rescue centres and shelters. This will help families looking to adopt a dog get a good understanding of the types of dogs looking for homes. Doing this early on will help a family plan for the type of dog that they are seeking to adopt. The rescue centre or shelter will be able to give information about the animals that they have available for adoption. This includes the age and gender of the dog, any information about how the dog gets on with other animals or children and any other important information. Most animal rescue centres, such as the RSPCA, will interview families looking to adopt dogs and carry out home visits. They may well have certain requirements that they are looking for. This might include requiring that a dog is not left on his own for longer than three hours or that the dog has access to a large garden. The rescue centre will base these requirements about what they feel is best for the dog and what will help the dog settle in well to his new household. The interview process will cover all the main points of adopting a dog and give plenty of opportunities for questions to be asked and concerns aired. An interview is usually followed by a home visit. A representative of the animal rescue centre will visit the home of a family looking to adopt a dog and check that the home and garden is suitable. They will also give advice about any modifications that might be useful, for instance a more secure gate. Rescue centres take rehoming dogs very seriously and want to make sure that both the potential new family and the dog are going to be well suited. Adopting a dog is not without cost. Many rescue centres will ask for a donation or make an outright charge. This will not be at a level that is prohibitive for many families, but it will be at a level that reassures the rescue centre that the family will be able to afford to care for their new dog in the future. This might include vet bills or other unplanned expenses. Rescue centres will also look to recoup the cost of neutering a dog or microchipping a dog. Many rescue centres offer ongoing support. They are very experienced at rehoming dogs and know the challenges that families face, particularly in the early days. Knowing that support is offered is very reassuring for a family looking to adopt a dog. Rescue dogs can make loving and loyal companions. Rescue centres have many dogs and other animals who are looking for a new home and a new opportunity for a happy life.